Just recently I witnessed my son go through soccer tryouts at high school. He is currently a sophomore and desperately wanted to make the team. Before tryouts I have watched him in awe do the little things that make all the difference to have his game ready. He practices daily on his own dribbling, juggling, shooting and fitness to make sure he and his game are in shape. During the week of tryouts, there were several nights of workouts, stress, and wondering if he had done enough to make the team. So, it is with us when we want a particular job. We do the little things to be prepared and have the experience for the job we want. We will research, network, prepare a resume, and practice our interviewing skills. Finally, if all goes well, we get word we have done enough to make the team or land the job. But then is it over? We can now surely rest and relax? Right? Nope! Now the work really begins. There are so many things to learn. We need to learn new processes, assimilate into a new culture, progress and continue to work hard. 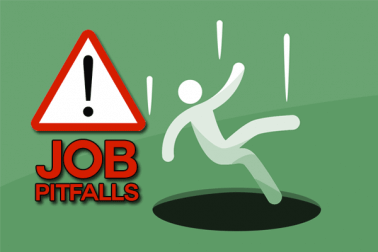 Let’s talk about a couple common pitfalls I see happen once the job is finally landed. My goal is to help you make your time on the job last. Job Pitfall 1: Time is a Dangerous Comforter. Don’t allow yourself to get complacent. Just because we have held the job for a while doesn’t mean we don’t have to continue to do the little things. Remember a career is a marathon and not a sprint. For example – attendance. I see many people for the first month or so of a new job have good attendance, but once time sets in magically every excuse you have heard of is presented on why those same people can’t get to work on time. Punctuality is a basic attribute for any job. It shows reliability. It shows you are a person that can be counted on. It seems so simple, but conversely if we are not on time our employers start to question other aspects of our job. Why would we want to have such a little thing put a chink in our new armor? If you ask a question will it make you vulnerable/less proficient? Will it weaken your position with the company because it shows you don’t know what you're doing? No one knows everything. We all need the help of others at some time. I believe in asking appropriate questions and then learning from them. That said, try to not ask the same question over and over again. Show you are listening and learning. This will show you are looking to improve, do the job right, and complete the job in a timely manner. Don’t get me wrong there are times we need to slow down and think through a process to learn it, but don’t allow pride to supersede the ability to do the job timely and right. Any athlete will tell you that to improve you need to perfect the basics of a sport. This provides a solid foundation that will allow you to take your game to the next level and excel. But even when you make it, you can't just sit back and drop into cruise control. You want to stay disciplined. So is the same with then new job you just landed. Don’t overlook the basics – work hard, show up on time and do not let your pride stand in the way of progress. This will give you a solid foundation to excel at your new job.